Sorry about the late post, I am guilty for not being as regular with my posts as I’d like to be hehe... I usually write whenever I feel like and whenever I can, but mostly the two don’t happen together. Today was different, I felt that I had to sit myself down and write this post or else I’ll burst!! LOL Has that ever happened with you, that you feel the strongest urge to sit down and just write your heart away? Hey don't worry though, I will try to keep it short, crisp and to-the-point! 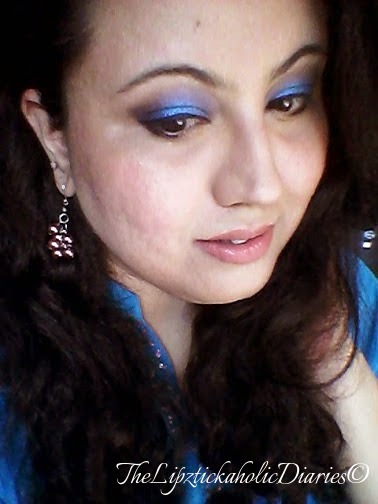 Today I will share how I created this 'Shimmery Blue eyes and N*de lips' look. It turned out really well that day and the best part about it was that I hadn’t planned on doing this. It just happened and turned out really great (or so I feel!!). 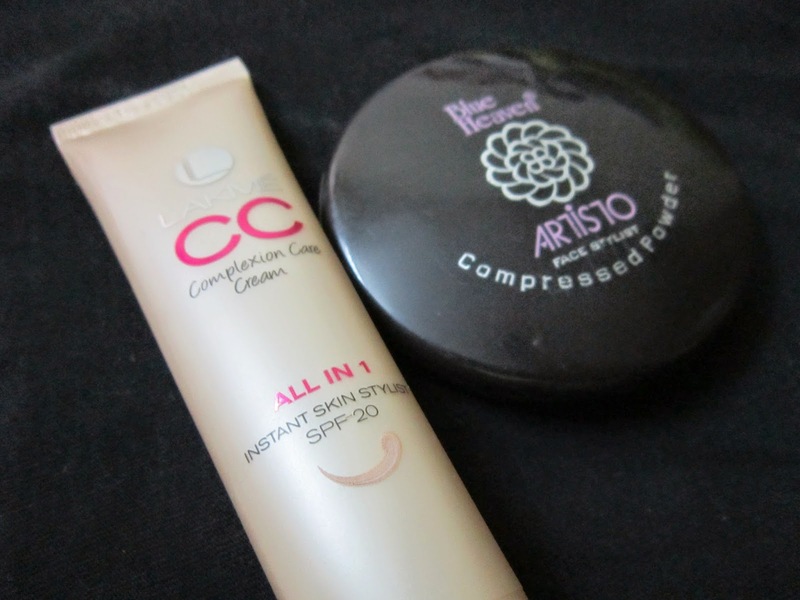 For the Base, I used my trusty Lakme CC Cream and set it with Blue Heaven Compressed Powder for a matte look. For the Eyes, I started with using a little foundation as an eye primer and set it with the same powder as mentioned above. Next, I took a flat shader eye shadow brush and dampened it by spraying a little water on it. 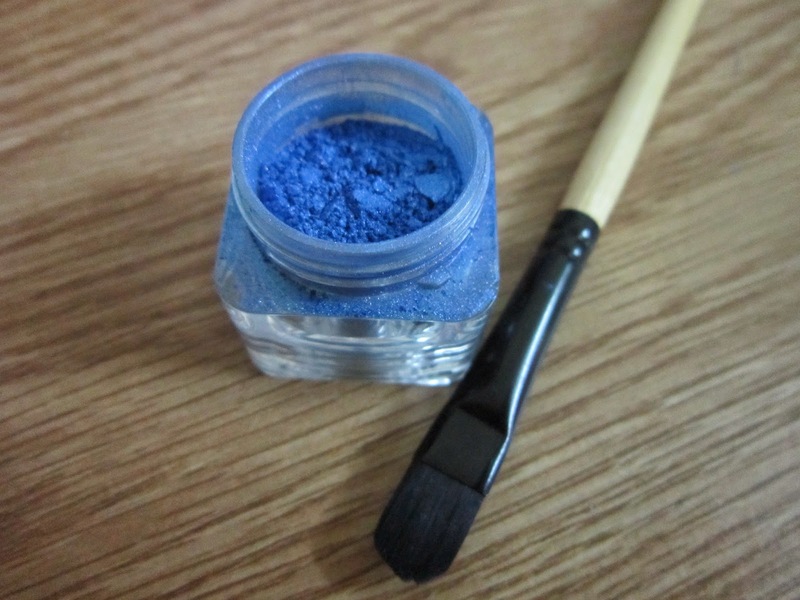 I picked up the Faces Canada Blue Sparkle Dust with this brush and dabbed it all over my eyelid, being careful not to go above the crease. Since the pigment is wet, there is less fallout and the flat shader brush also helps. ('Fallout' is the extra eye shadow that 'falls out' on your cheek during eye makeup). In case, you do have fallout, wipe it off with a baby wipe or a dry brush gently, so that you don't mess up your foundation. Or better still, first finish the eye makeup and then go for foundation! Once I had the intense blue colour that I was looking for, I waited for it to dry. Taking a little bit of a purple eye shadow, I used this to blend out the harsh edge of the blue shadow on the crease. Since I have hooded eyes, I blended this purple shadow a little above the crease so that its visible when I look straight ahead. (Hooded eyes simply means that when I look straight ahead, there is very little space between the brow bone and eye-lid). 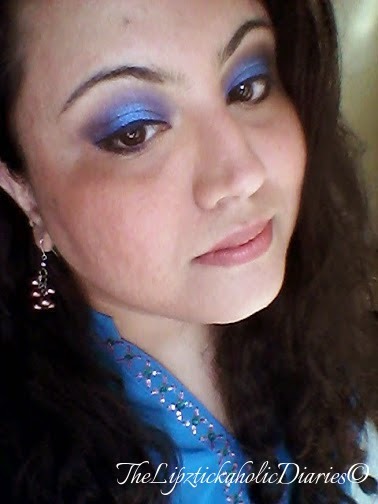 Once the blue and purple were blended well, I lined my eyes with Elle 18 BlackOut liquid liner and used the Lakme Eyeconic Brown Kajal to line the lower lash line. I lined this only half-way and left the inner corners bare, to open up the eyes. 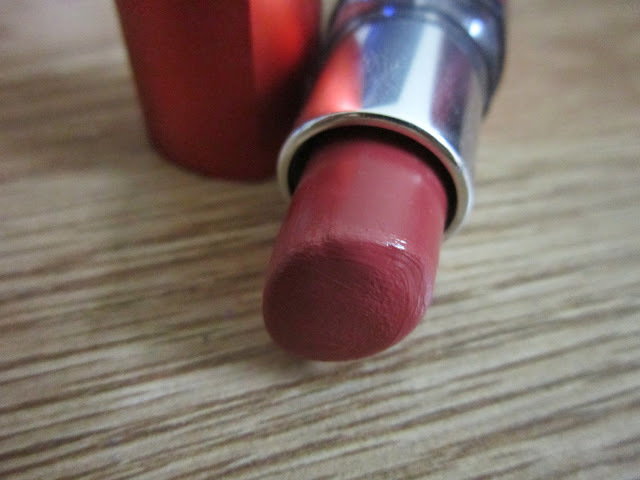 For some warmth on the face, I used the Lakme 9 to 5 Blush in Peach Affair. As I wanted the eyes to be in focus, I opted for a n*de shade on the lips. I used Maybelline ColorSensational lipstick in Bronze Orange to finish off the look. I was always apprehensive of working with pigments but with practice, I've become slightly comfortable with them. I loved this look that I created and was absolutely surprised when it elicited a “WOW! !” from the Husband! Now who doesn’t like that eh? 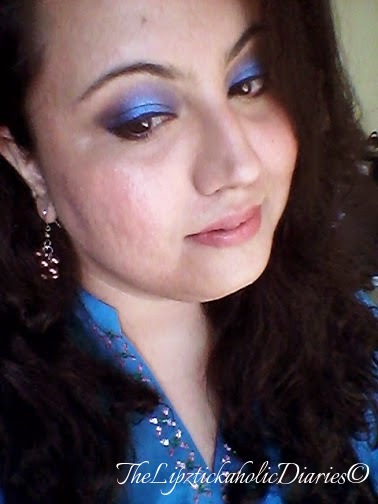 Do try out the look with Blue or any another colour of your choice and let me know how it turned out. Do leave me comments in the comments section below!! Till then, in the words of my toddler, Baa-Byeee!! You work with blue so well..